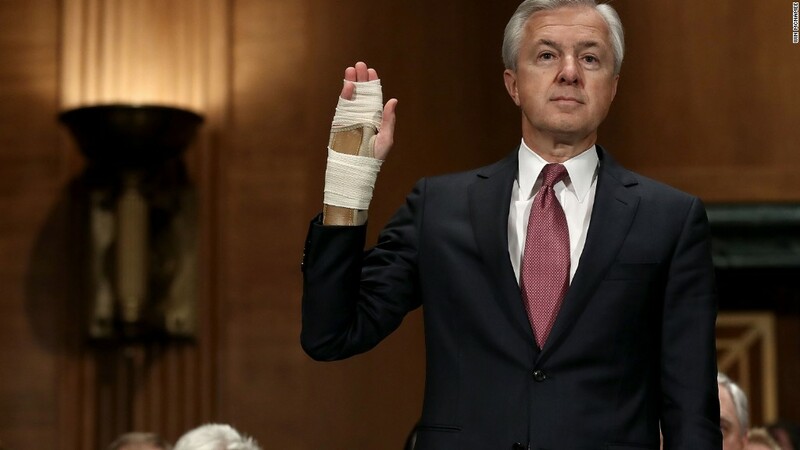 Former Wells Fargo CEO John Stumpf told Congress under oath last month that he wasn't notified of a serious fake account problem at the bank until 2013. However, CNNMoney has obtained a 2007 letter addressed to Stumpf that warned of widespread "unethical (and illegal) activity" inside Wells Fargo and the "routine deception and fraudulent exploitation of our clients." The letter was written by a Wells Fargo (WFC) employee, who had been transferred from the branch after raising sales concerns, and who later won a federal whistleblower retaliation case against the company. Eerily, the letter seemed to predict the scandal Wells Fargo is dealing with today. "Left unchecked, the inevitable outcome shall be one of professional and reputational damage, consumer fraud and shareholder lawsuits, coupled with regulator sanctions," the letter warned. It said the illegal activity in Northern California was "widespread and so highly encouraged that it has become a normal sales practice." The employee copied Stumpf on a second letter addressed to the audit and examination committee of Wells Fargo's board of directors. That letter to the board made similar warnings of "illegal and unethical activity and fraud," adding that the "activities remain ongoing to this day." CNNMoney hasn't been able to determine whether the letters were actually sent, nor whether Stumpf or the board members read or received them. The employee, who has since left Wells Fargo, declined to comment for this story. The Wells Fargo sales tactics revealed by regulators in September were staggering in scope: 5,300 employees fired over the creation of as many as 2 million fake accounts between 2011 and 2015. However, the whistleblower's letters, combined with testimony from other employees, suggest the shocking scandal could be even more massive and began years earlier than Wells Fargo has admitted. The Wells Fargo board said it was not "aware" of the letters. However, when provided the letters by CNNMoney, the board said the letters will now be included in the independent investigation being run by the law firm Shearman & Sterling. In a separate statement, Wells Fargo said "in general, letters received by John Stumpf would have been forwarded to the appropriate channel for review, investigation and response." Wells Fargo also reiterated that it has recently made "fundamental changes to help ensure team members are not being pressured to sell products." The bank ended the controversial sales goals for its employees on October 1. Wells Fargo said it was unable to pass along requests for comment to Stumpf, who announced his sudden retirement on October 12. The former CEO did not respond to a call placed to his home. Stumpf is walking away with around $130 million in Wells Fargo shares and other payouts he accumulated during his three decades with the bank. That's despite the fact that he had to give up $41 million in stock awards amid the scandal. The employee won a federal whistleblower case against Wells Fargo in 2008 for a similar complaint. Such wins are extremely uncommon: Just 2% of whistleblower cases are found in the favor of employees, according to a 2010 Labor Department Inspector General report. In this Wells Fargo case, a division of the Labor Department found there was "reasonable cause to believe" Wells Fargo violated whistleblower protection laws by transferring the employee after he flagged illegal activity. The Labor Department ordered Wells Fargo to restore the employee to his old branch, pay damages as well as back wages and bonuses. That complaint focused specifically on the creation of fake brokerage accounts, which violated SEC rules and thus triggered Sarbanes-Oxley whistleblower protections. In the 2007 letter to Stumpf, the employee wrote it was his "final hope" for reporting the fake account activity internally. "All attempts to utilize traditional channels to report this information has been met with immediate and lasting retaliation," he wrote. The employee insisted he was not a "traitor" for blowing the whistle. "Despite having been slandered, publicly discredited and effectively blacklisted, I have remained loyal to Wells Fargo," he wrote. This isn't the first evidence suggesting Wells Fargo employees tried to flag upper management about alleged fraud only to have those warnings fall on deaf ears. According to Senator Bob Menendez, a New Jersey woman who worked at Wells Fargo emailed Stumpf in 2011 to describe sales tactics she felt were "wrong." At last month's Senate hearing, Menendez read the former employee's email to Stumpf. "Okay, well she was fired...So much for the safe haven," Menendez said. Wells Fargo recently expanded its review of accounts to include both 2009 and 2010. Almost a dozen Wells Fargo workers have also told CNNMoney the tactic of opening fake accounts to meet unrealistic sales goals had been around for much longer. Susan Fischer, a former Wells Fargo branch manager, recalled being instructed to tell employees to open accounts without the required signatures back in 2007. "These practices were going on way before 2011," Fischer said.